It is December - one of my favourite months! This year I have done so much preperations beforehand, so I hope for a peaceful Advent with lots of joy, crafting and candles. It is dark most of the time now, so for me there is nothing better than making a great cup of tea, light some candles, listen to Christmas music and make something for Christmas. Hope I can inspire you to do the same. 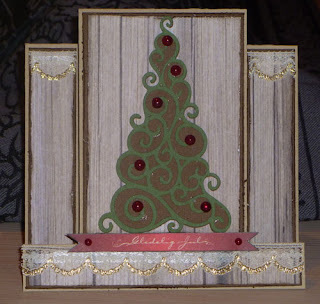 The die cut challenge at Stuck On U Sketches this week is the Christmas tree. I know that a lot of my american friends have this up and lit already, but in Norway we don't usually decorate the tree till December 23d. 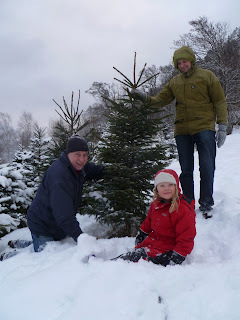 Last year we spent at my parents house, and we got to cut our own tree. This year we are at home in Bodø, so we have to settle for a store bought one, but I long as I can smell the needles on the tree I am happy! Enough chatting and on to my card: I have used one of the Christmas trees from the Christmas solutions cart for my card. I love this swirly tree. there is a quite similar one on the Lyrical letters cart, but I think this is the more elegant one. Gorgeous! I've always loved that tree cut. Great card design too! So Pretty! This is one of my favorite trees too! Looks like alot of fun with the family getting the Christmas Tree, great picture! Wow this is so beautiful! Love the colors .. absolutely ELEGANT card!